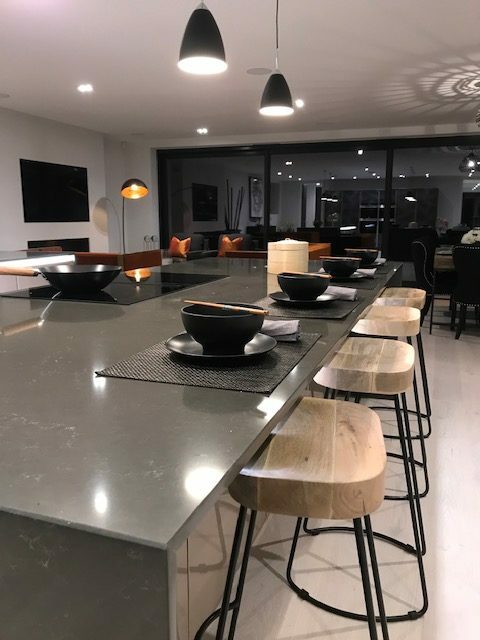 For this newly constructed super home in the exclusive Canford Cliffs area of Poole in Dorset, Meridien Interiors designed and installed a stunning double island kitchen using First Impressions’ Cosdon range in Pink Champagne and Foundry Black steel finishes. 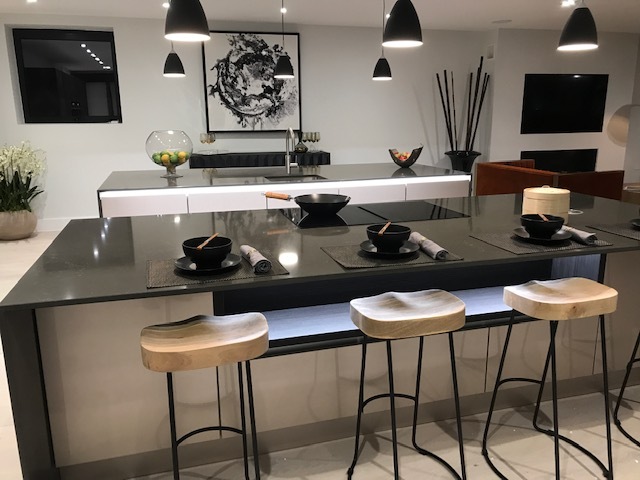 This innovative ultra-linear kitchen is a key focus of the main living area and is particularly distinctive for its two large separate islands which, together with a bank of tall units, ensure the kitchen is centrally positioned in the room. 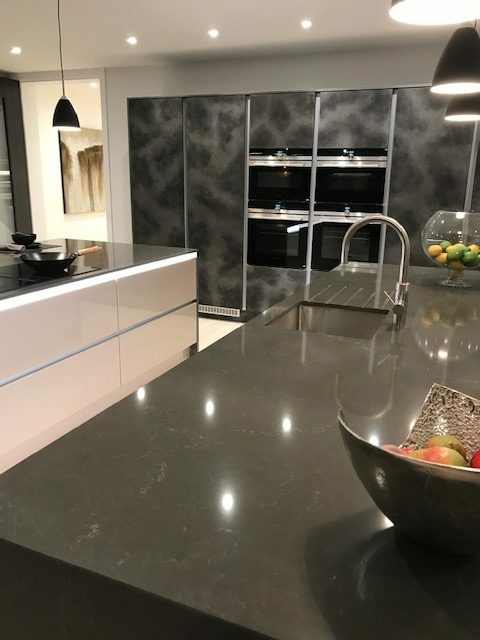 The two islands feature Cosdon Pink Champagne handleless highline base cupboards and pan drawers with a Unistone Cinza polished grey quartz worktop. One island incorporates the Air Uno black glass flex induction hob and Air Uno countertop extractor while the second island includes the large 1000mm Franke sink and drainer with a Quooker flex round stainless steel tap for instant boiling, hot and filtered cold water. An AEG 46 bottle wine fridge and Siemens Built in IQ300 integrated dishwasher are also incorporated into the island design. 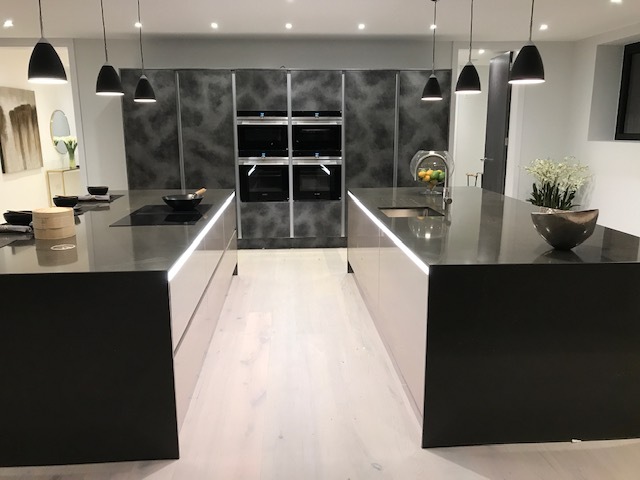 Not only designed to provide practical storage and hide appliances, the islands also include a stylish recessed display shelf illuminated by LED linear lighting which adds further visual interest to the overall look. 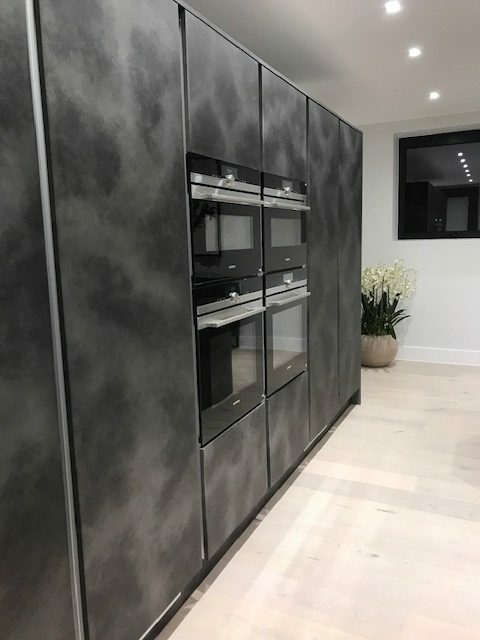 Along the back wall a tall run of handleless units in First Impressions’ Foundry Black Steel house Siemens IQ700 appliances including two multi function ovens, a steam oven and a compact oven with microwave in black and stainless steel. Also contained in this run of tall units is a Siemens built in larder fridge and Siemens larder freezer together with two pullout tandem larder cupboards. Linear lighting around the underside of the worksurfaces illuminates the brushed aluminium recessed rails to stunning effect which, together with the lit under counter display recesses, create an attractive feature. 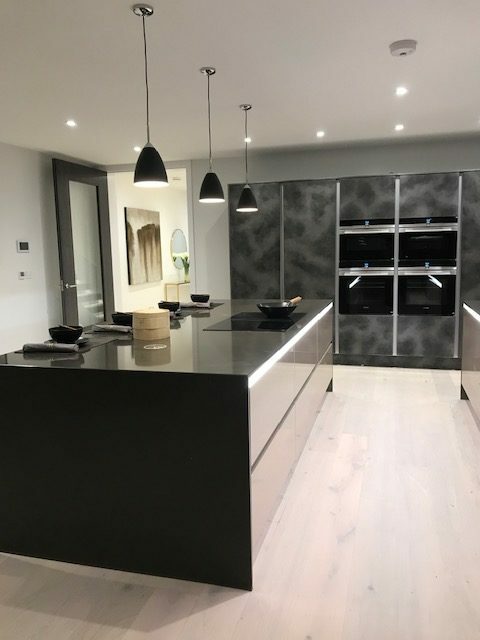 Meridien Interiors also designed and installed the utility room for this property which included handleless Cosdon units in Porcelain white together with a Blanc Megeve worksurface. For further information about Meridien Interiors’ kitchens and bedrooms, please visit www.meridien-interiors.co.uk or call 01202 216688. Or call into the Meridien Interiors showroom at Unit 62, Azura Close, Woolsbridge Industrial Estate, Three Legged Cross, Wimborne, Dorset BH21 6SZ.